Welcome to CARM, the Canadian Association of Railway Modellers, located in Canada but with members from many areas around the world. 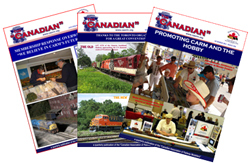 CARM is both for Canadians as well as those with interests in Canadian Railways or model railroading or both. Our membership in the organization is open to anyone that wishes to join. Our members area has more content that is only available to members which includes an archive of images that have a Canadian Railway theme in a higher resolution than those available in other areas of this website. Also members have access to all of the newsletters ever printed by CARM as electronic downloads in PDF format. We have been transitioning to newer types of membership and while doing this we have noticed that some members have not renewed or in some cases information has become out-of-date. Please take a few minutes and update your membership information. Use the 2018 membership form for updates as well as renewing or joining. Response to your update may take a little more time as this the holiday season and time for all our volunteers is limited so please be patient. Also be sure to use the 2018 membership form. As a member of CARM you now have the ability to pick which chapters you would like to receive infromation from. Starting now a form has been added, that can be found in the menus to the left in the members area, to select these choices. Be sure to fill out this form so that you will get the latest news from that chapters that matter to you. General Members and Internet with Calendar Members are entitled to be mailed 1 calendar as part of their membership. Internet Only Membes (FREE Memberships) do not receive a calendar. There are a limited number of extra 2019 calendars available at a cost of $10 each in Canadian funds for those being mailed to a Canadian adress only. For any being mailed to an address outside of Canada the cost is $10 each in US funds. The cost includes regular surface mail. If you would like to order 1 or more calendars follow these instructions. Contact the Membership Director with the number of calendars you would like to order along with your mailing address. The Membeship Director will send you an invoice for the calendars allong with instructions on how to pay for your order and confirm that the number of calendars ordered are available. Once payment is received the calendars will be mailed to you. Payments can only be made using PayPal or by cheque. CARM has been working along with the organizing group from London for the next Super-meet. Bruce Harmer has supplied the following information. 9:30 p.m. – 11:00 p.m. railroading movies. Each year in Copetown, Ontario, CARM supports the Copetown Train Show operated by the Bayview Modular Group. "A Showcase of Canadian Railway Modelling" that includes manufacturers, layouts, displays and more. This next show will be in 2020. For the date, time and detailed information check back our Current Events page. Each year there a number of CARM events that are run which are organized by various chapters. Meetings are held in various locations and are open to all CARM Members. Guests are also welcome at most events. Check out the Chapter page as well as the Events page for activities in your area. CARM is proud to produce a newsletter, The Canadian, that has been published since the starting days with the first issue dated for January 2004. Currently the newsletter is published four times a year and is available as both a printed version and an electronic download in PDF format. An example of a newsletter can be found by clicking on the menu bar to the left. To obtain electronic downloads for all of the issues you can log into the members area, you must be a member to access this feature.